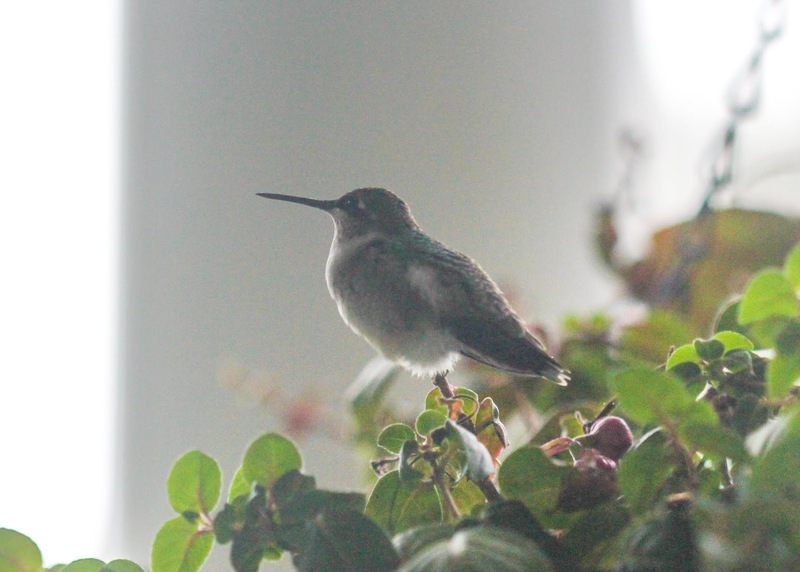 What do Hummingbirds do in a Downpour? 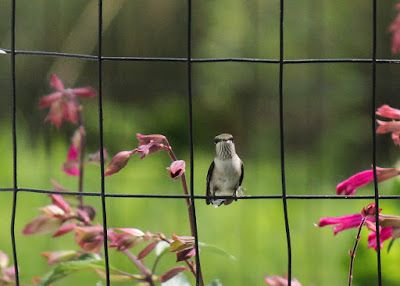 We've had some cold and stormy weather lately with heavy rain throughout the day, and the bird feeder has been quite popular. 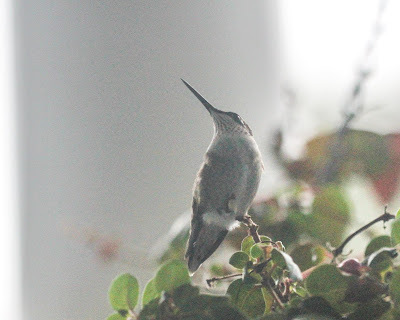 But what do the tiny hummingbirds do in a downpour? Researchers used slow-motion cameras to find that hummingbirds have a method to cope with even heavy rain. Much like a dog, they whip their heads back and forth in mid-flight to shake the water off of their feathers. 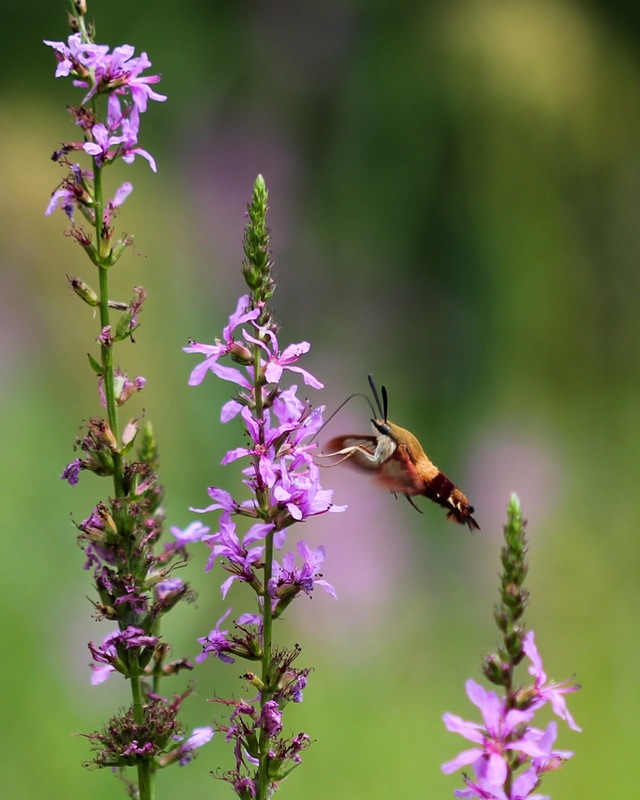 Incredibly, hummingbirds do this with acceleration that reaches a g-force of 34 - five times faster than a Formula-1 race car! ... and catch a few little bugs. 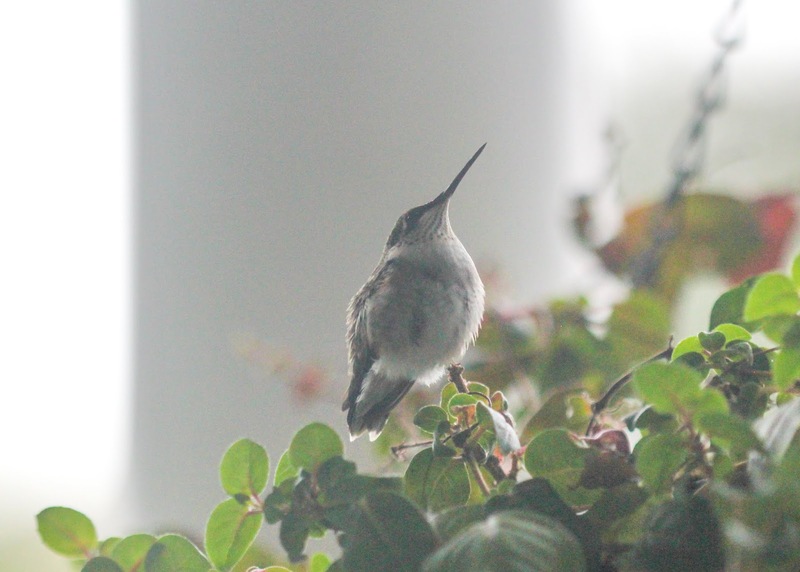 She looked so cute fluffed up against the cold, wet day. I doubt I will see her or the other hummingbirds for very much longer, as it is about time to head south for the winter. After this week's weather, she is probably eager to start her migration! Everywhere we turned last Sunday, there was a trap. 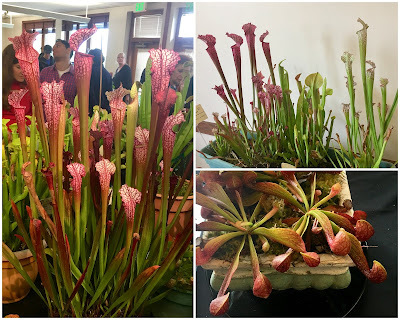 We were at what was probably the most dangerous plant show on the East Coast - the annual Carnivorous Plant Show put on by the New England Carnivorous Plant Society at Tower Hill Botanical Garden. 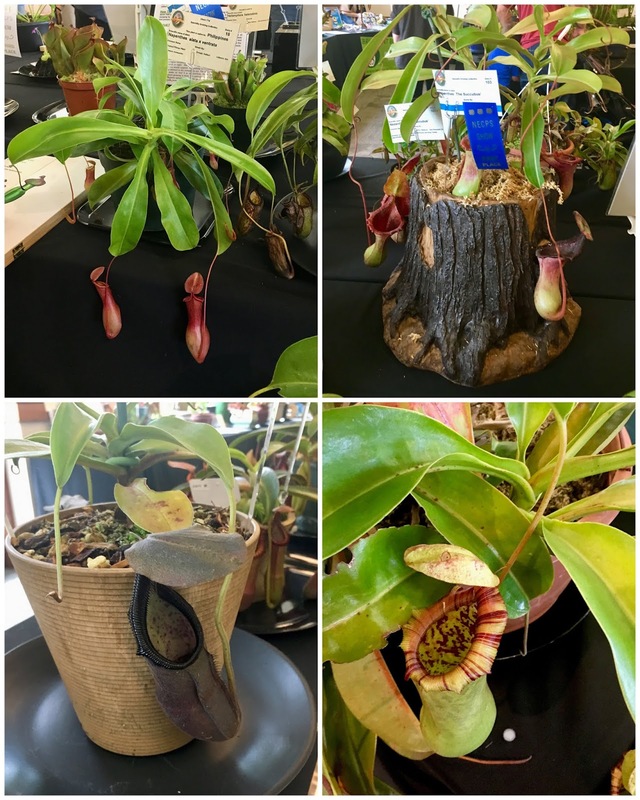 And what an amazing collection of plants it was! 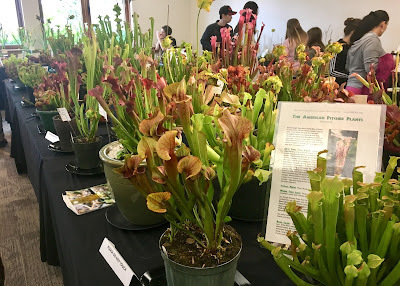 My personal favorites have always been the Sarracenias, our native Trumpet pitchers, and there were many gorgeous varieties to be seen. 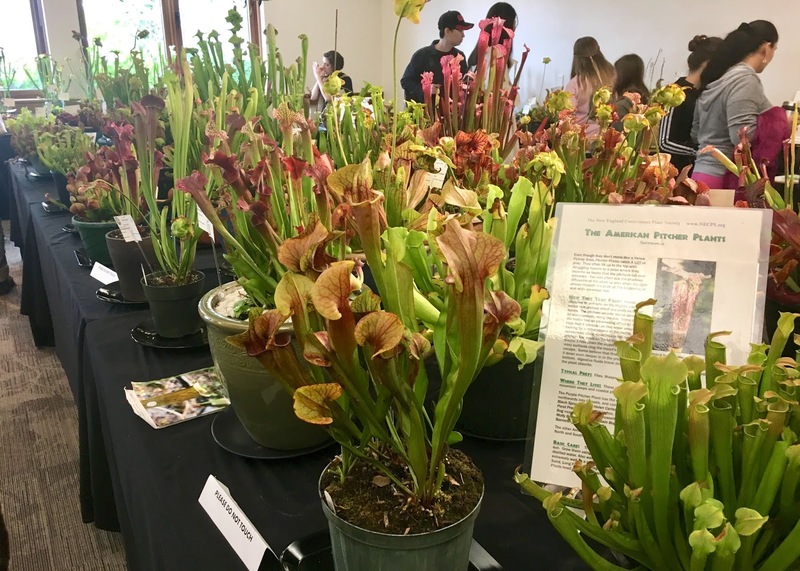 Most Sarracenia are native to bogs and marshes in the Southeastern US, but there is one that is native here in New England and rightly well represented at the show - Sarracenia purpurea, aka the Purple pitcher plant. Most pitchers have hoods that prevent too much rainwater from getting into the pitcher and diluting the digestive fluids in it, but the hood of the Purple pitcher plant is less covering, letting the tubes fill with water. 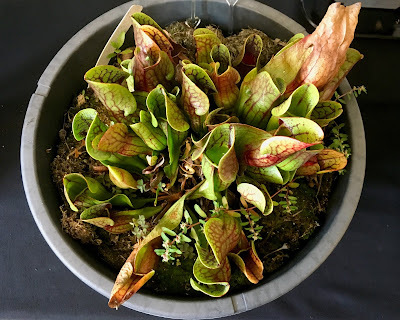 A whole little microcommunity of bacteria and invertebrates live in this pitcher water and helps break down the prey to make the nutrients more usable to the pitchers. Also native to North America is Darlingtonia californica, aka the Cobra Lily or the California pitcher plant. 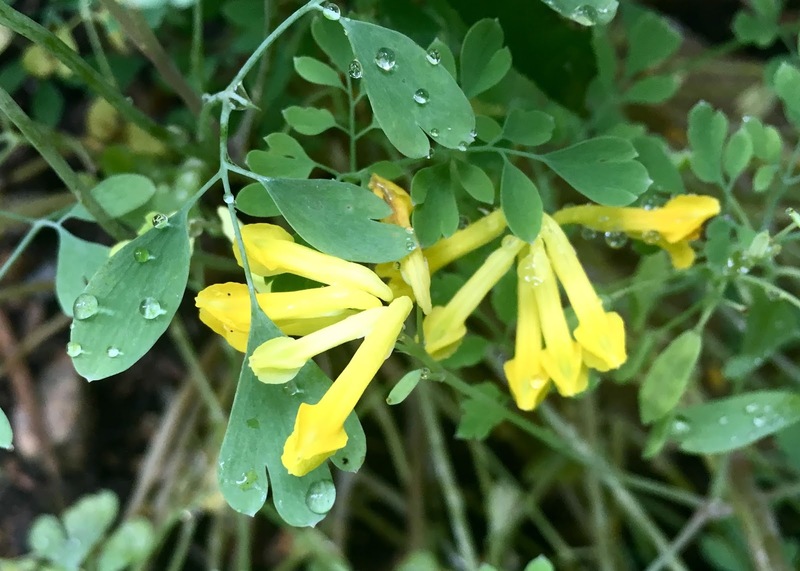 Native to bogs and streams in Northern California and Oregon that are fed with cold mountain water, these can be hard to grow in cultivation. 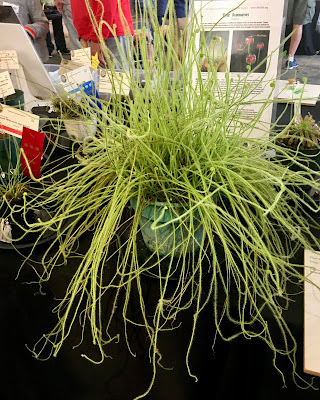 The roots of this plant start to die back if they get warmer than 50°F (10°C). 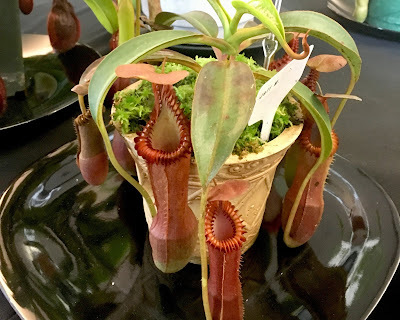 Members of the New England Carnivorous Society took it on as a challenge to grow these plants for this year's show, with somewhat varying success. 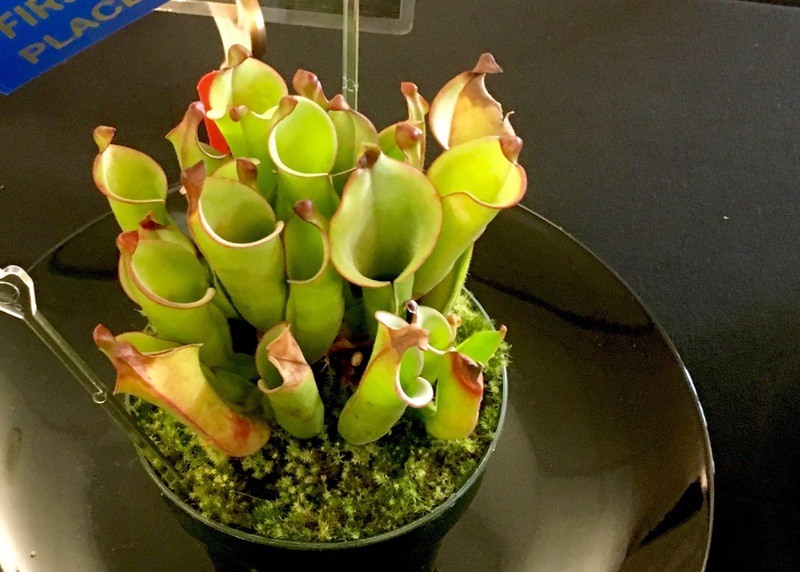 In South America live the counterparts of our native pitchers, the Sun Pitchers, or Heliamphora. Instead of a hood or lid, these pitchers boast a 'nectar spoon' on their tops, which attracts prey. 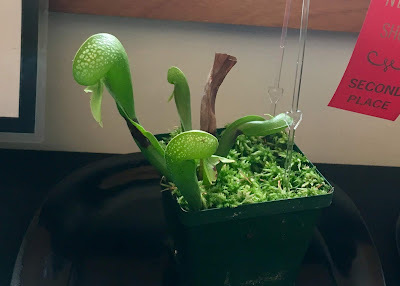 A slit in the side of the pitcher regulates the level of rainwater inside the pitchers. 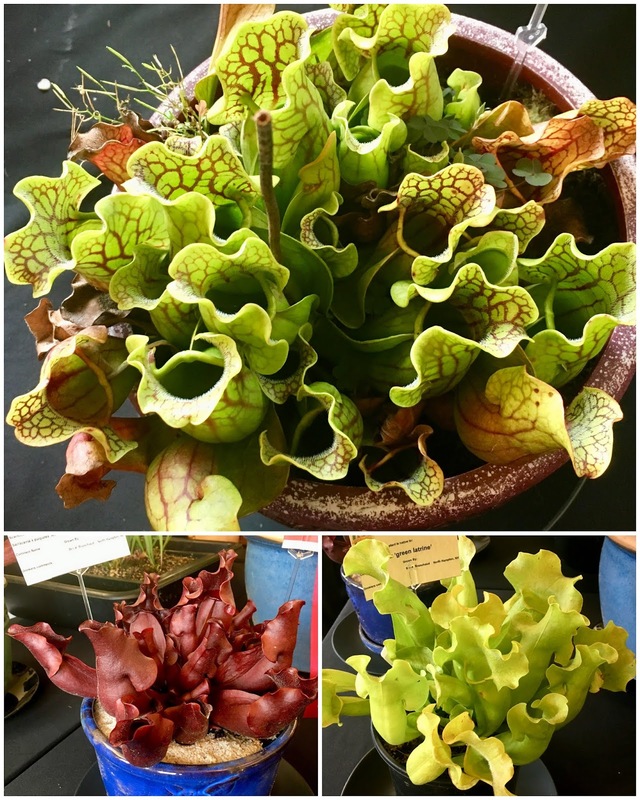 Tropical pitcher plants Nepenthes look very different from Trumpet pitchers or Sun pitchers. 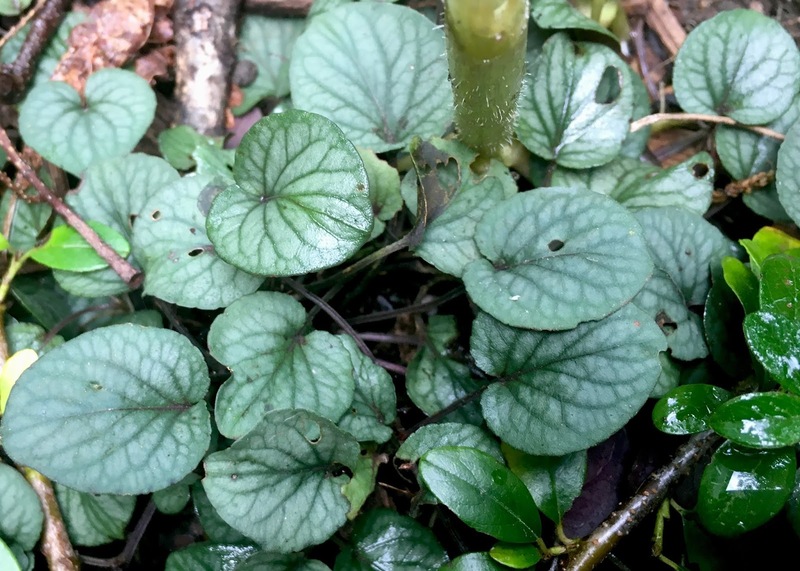 Most are vines and can grow up to several meters long. The tips of the modified leaves produce tendrils, which form into pitchers. 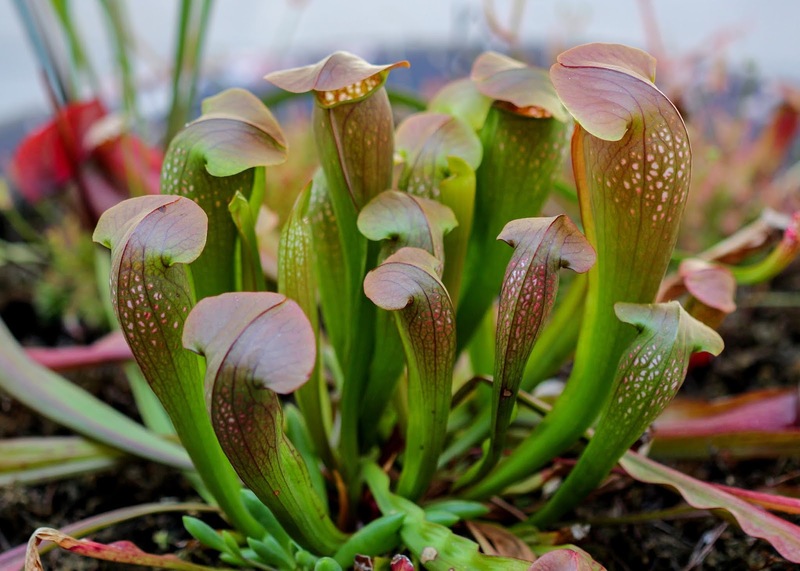 Some tropical pitcher plants produce huge pitchers that are capable of ensnaring small critters like mice or lizards. Sundews, or Drosera, have a completely way to catch insects. Their leaf surfaces are covered with many tiny tentacles, and each tentacle has a drop of sticky substance at the tip to lure and entrap prey. 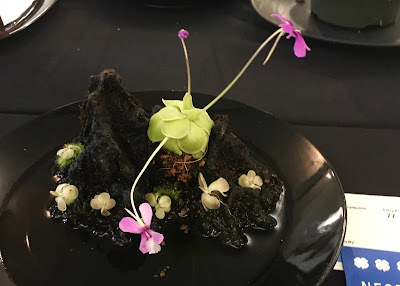 Anything that lands on it becomes stuck and subsequently digested. ... to large and rather threatening to those who pass by. I think this one ate its sign. 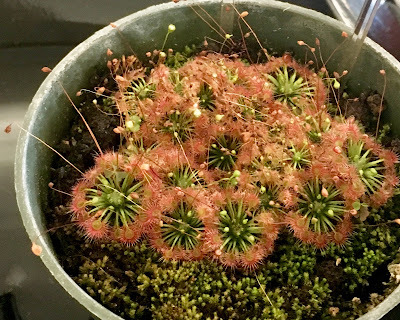 It is likely Drosera tracyi, which is native to the US. Carnivorous plants do have blooms! 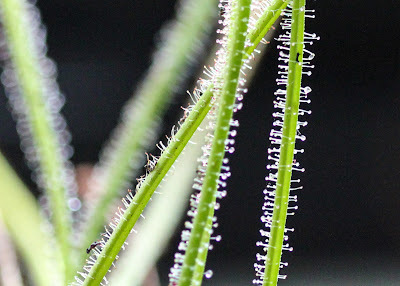 Most hold their flowers on long stems far above the plant, so that they don't block possible prey from approaching the plant. 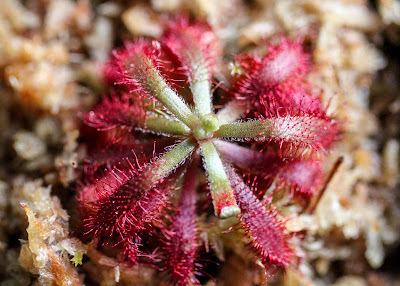 Butterworts (Pinguicula) are carnivorous plants that are usually grown for their pretty flowers. The leaves look much like succulent leaves but are sticky to catch small insects. However, instead of roots, these plants have modified, corkscrew-type leaves that catch tiny insects under ground. 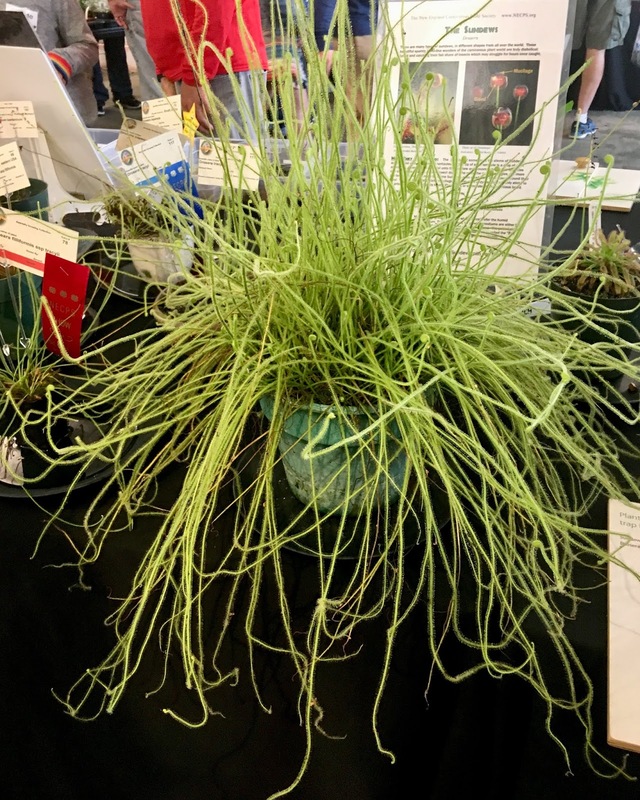 The show even featured an aquatic carnivorous plant - the Waterwheel, or Aldrovanda vesiculosa. 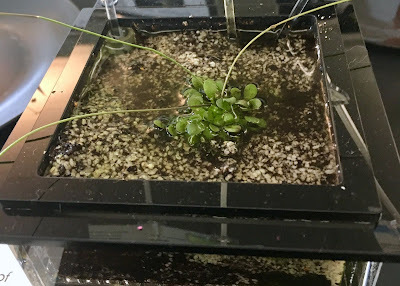 Waterwheels float just under the surface of the water and catch prey in traps that look much like those of a Venus flytrap. 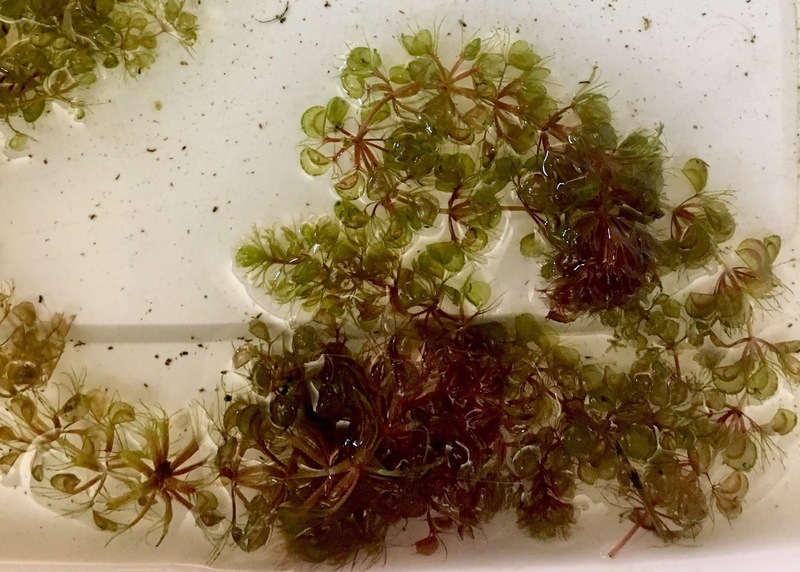 They are native to lakes and ponds in the Western Hemisphere and spread by sticking the feet of passing birds. 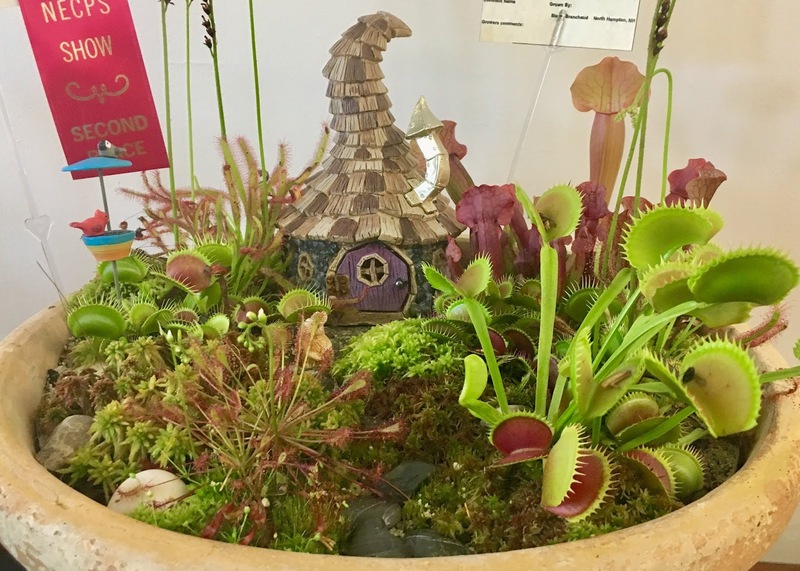 And of course, no self-respecting Carnivorous Plant Show would be complete without a thoroughly lethal-looking fairy garden. The nicest plants in the garden are first and foremost, of course, free. 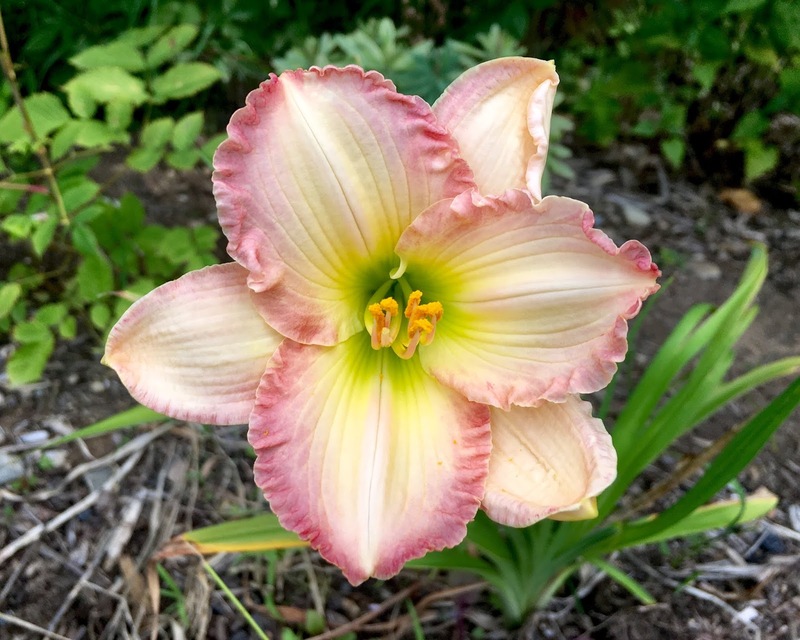 Preferably they have been given to you by a lovely and generous friend, so that every time you see your plants you can be reminded of them. 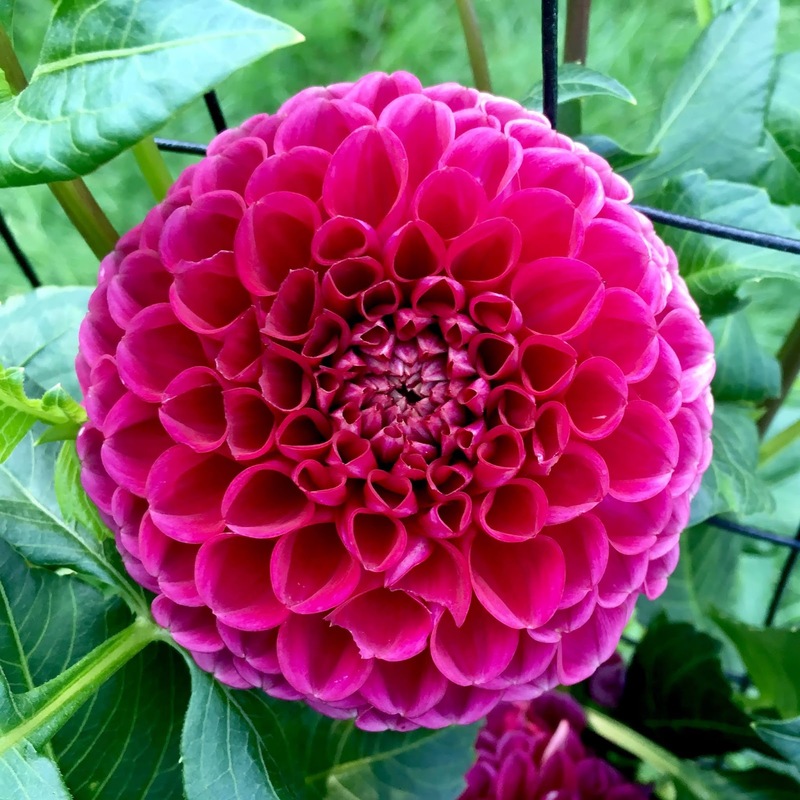 Such is the case with my beautiful dahlias. 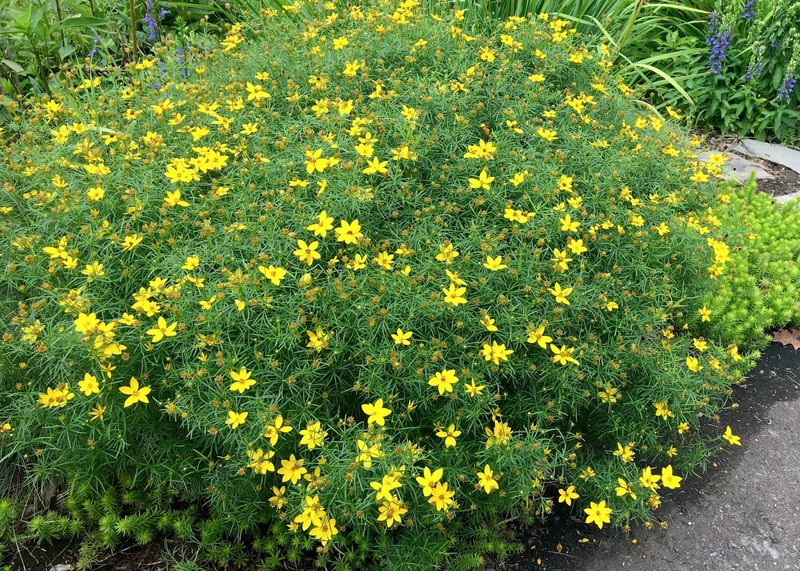 Amiable plants also pop up in the garden even though you never bought them. Perhaps they came as a freebie with another plant you bought and you never really even noticed it until it surprised you with delicate yellow blooms one day, such as this Yellow Corydalis in the shade garden. Of course the best plants come back every year after winter - even if they are not rated hardy for your zone. 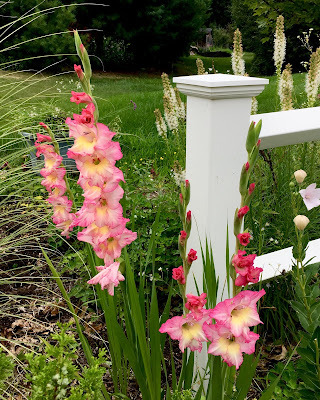 My 'Priscilla' Gladiolas shocked me with their return after a harsh winter. Looking online, it seems this variety is among the hardiest of the showy gladiolas. I hope it keeps coming back. That would be quite nice and obliging of it. 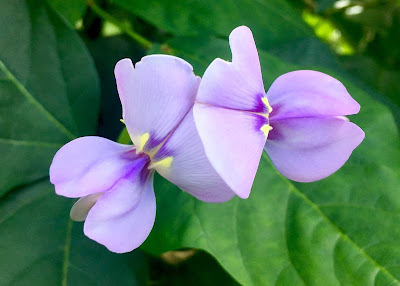 The most polite plants also keep popping up in the garden even after a gardener is sure that she has killed it. Good to see you again, Viola walteri 'Silver Gem'. 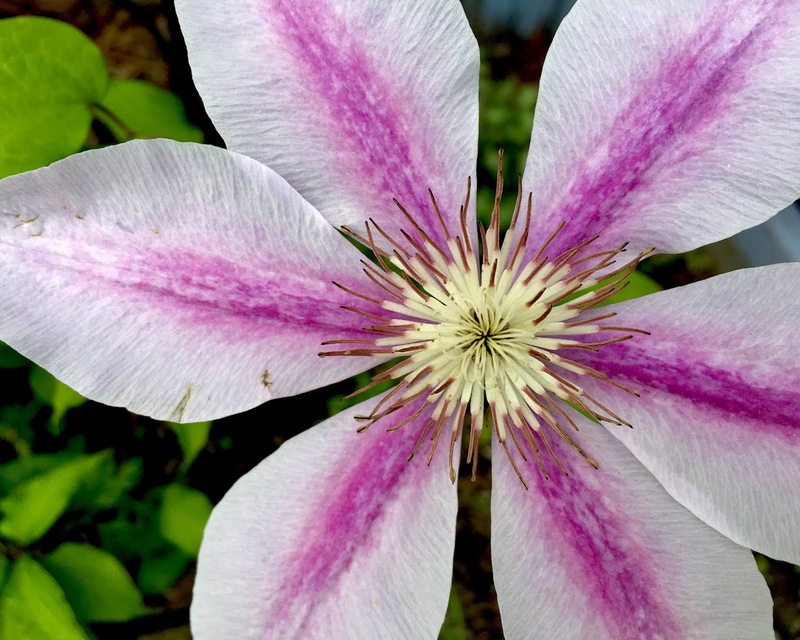 A really obliging plant produces both food and beautiful flowers. Of course, if the plant was truly obliging, those flowers would be fragrant... Check, check, and check for the Chinese Red Noodle Bean! 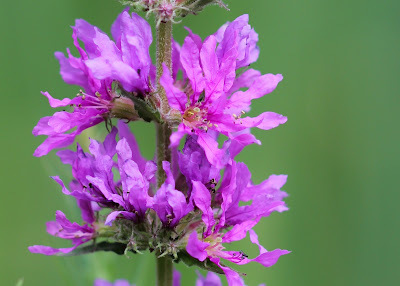 Not all plants have such showy flowers. A well-mannered plant works whatever blooms it has with gusto for the pollinators. 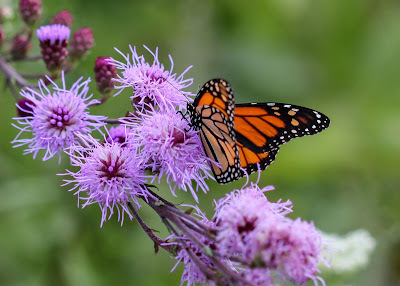 This Liatris ligulistylis might have blooms that are straight out of a Dr. Seuss book, but it is completely irresistible to Monarch Butterflies. 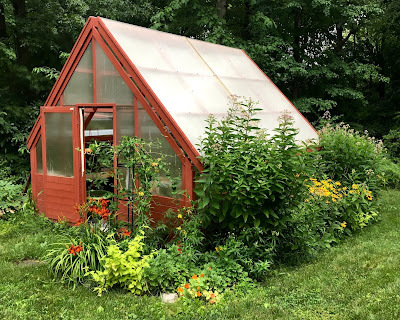 The best plants of all realize that their gardener planted them in the wrong spot and MOVE THEMSELVES over a couple feet to a better one (and one where the gardener was struggling to grow other things). 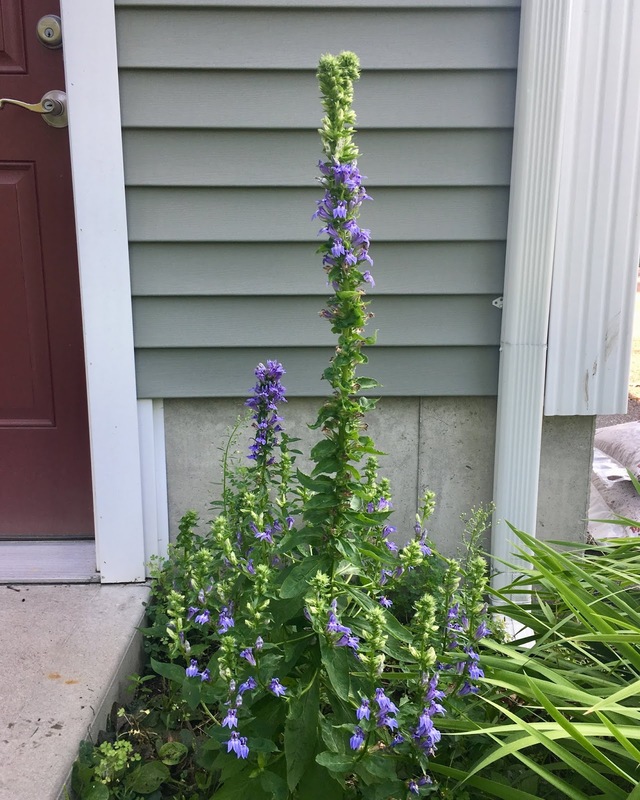 I swear I did not plant this Great Blue Lobelia there. 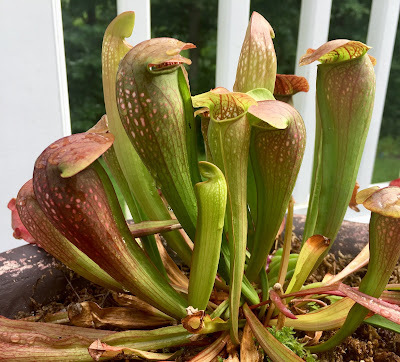 Ah, thank you dear Pitcher Plant! That's very considerate of you! 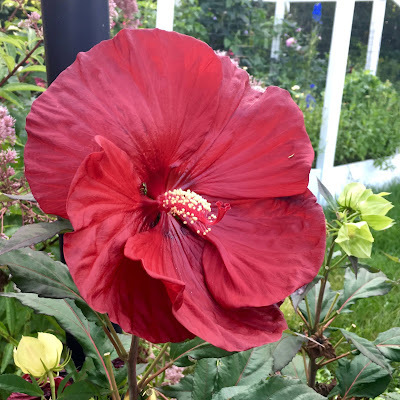 Do you have any particularly obliging plants in your garden? 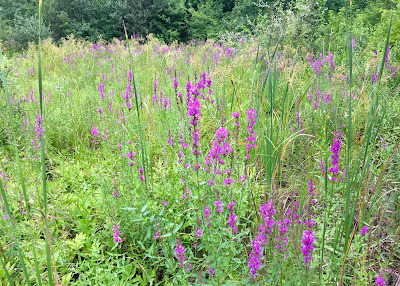 It's the height of summer, and the Purple Loosestrife in my detention pond is in full bloom. However, when I say full bloom, I mean FULL bloom. For here in North America, Purple Loosestrife, aka Lythrum salicaria, is a highly invasive plant. There's no denying that this particular invasive is a strikingly gorgeous plant. Hailing from Europe and Asia, this wetland plant has been prized throughout history as an ornamental in the garden in addition to its medicinal use for gastrointestinal ailments. Overseas, there are a number of cultivars of Purple Loosestrife. 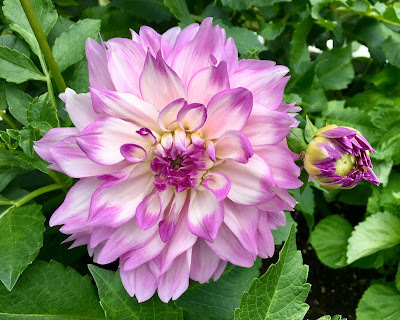 'Blush', which has pale pink flowers and 'Feuerkerzeze', which has sterile, vividly-colored double flowers, have both won the British Royal Horticultural Society's Award of Garden Merit. 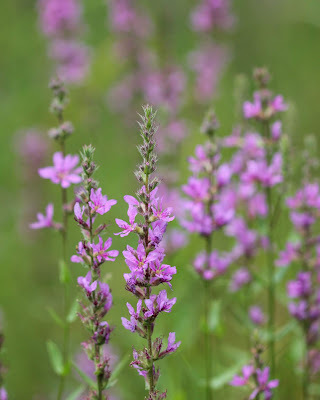 In the 1800's Purple Loosestrife was introduced into North America either accidentally as seeds floating in ship ballast water or intentionally as an ornamental. 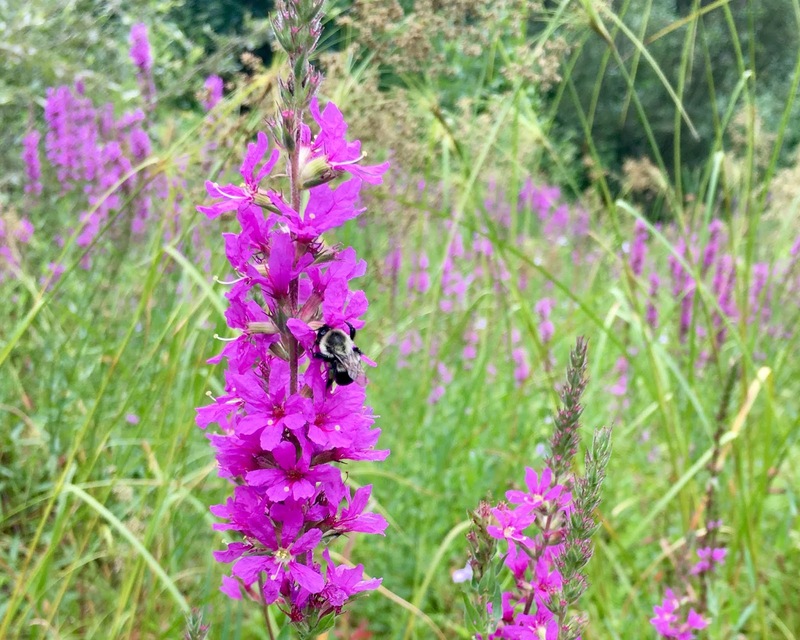 In the years that followed bee keepers spread it to other parts of North America, as its many flowers offered an abundance of nectar for the bees. 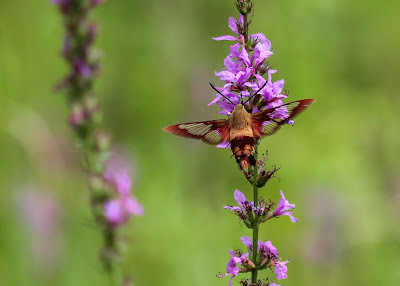 It has since spread into most US states and up into Canada. While bees and other pollinators love the flowers, unfortunately there are not many animals or insects here that eat the plant to keep it in check. 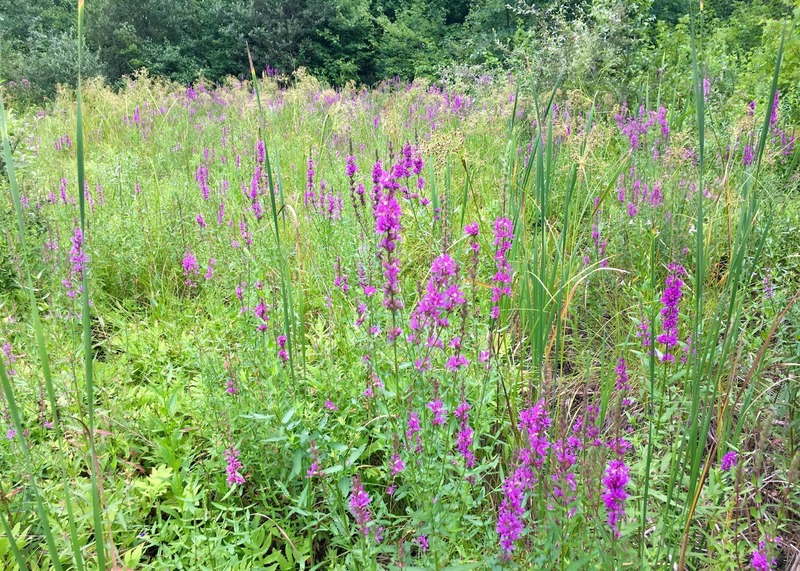 Purple Loosestrife invades wetlands, crowding out native plants. It forms dense, impenetrable stands that are unsuitable for native wildlife such as ducks, frogs and turtles, and these animals are often forced to relocate. 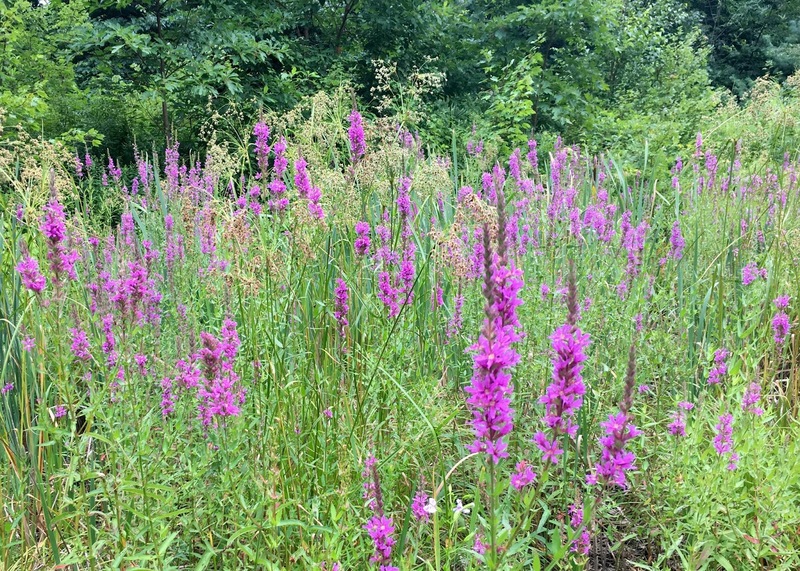 Once Purple Loosestrife is established in an area, it is nearly impossible to get rid of due to the immense number of seeds each plant produces. 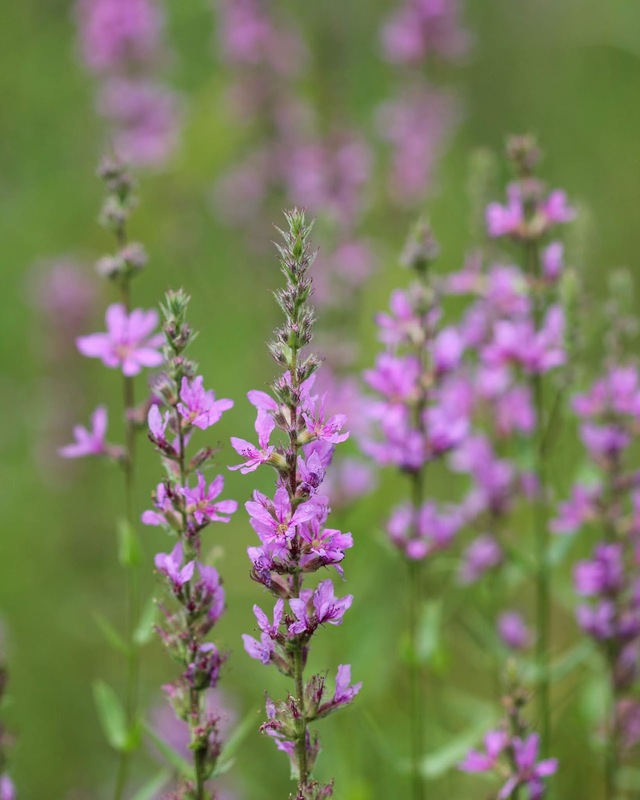 A mature plant can produce millions of seeds, and these seeds remain viable in the soil for years. It can also re-sprout from any pieces of roots left in the soil or water. 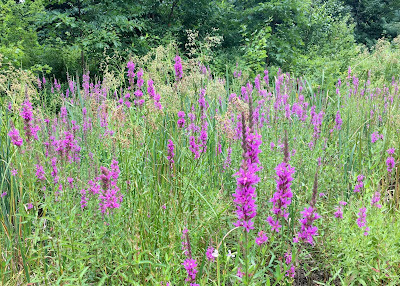 Managing this invasive plant by manual removal, burning, cutting, herbicides, and water management have all been tried... and found to be either too difficult, too costly, or environmentally unsuitable. Thankfully, testing for a biological agent is now much more rigorous. 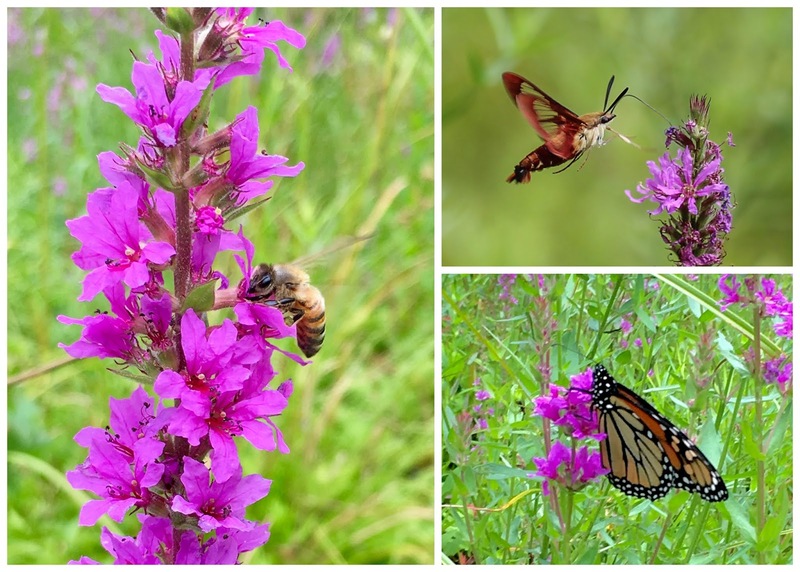 Scientists considered over 100 insects overseas that were known to feed on Purple Loosestrife. Several were thought to have possibility, and extensive testing began in Europe. The insects were exposed to many North American species of plants to make sure that they would not end also attacking our native plants if introduced here. 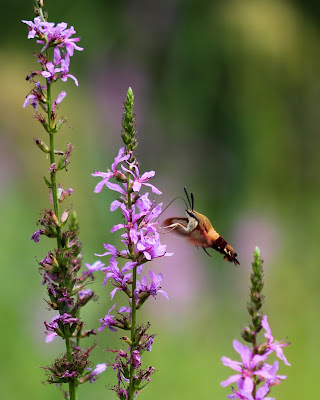 In 1992, after six years of testing, the US Department of Agriculture approved four insects for release into the US for the control of Loosestrife: two leaf-eating beetles (Galerucella calmariensis and Galerucella pusilla), one flower-feeding weevil (Nanophyes marmoratus), and one root-boring weevil (Hylobius transversovittatus). 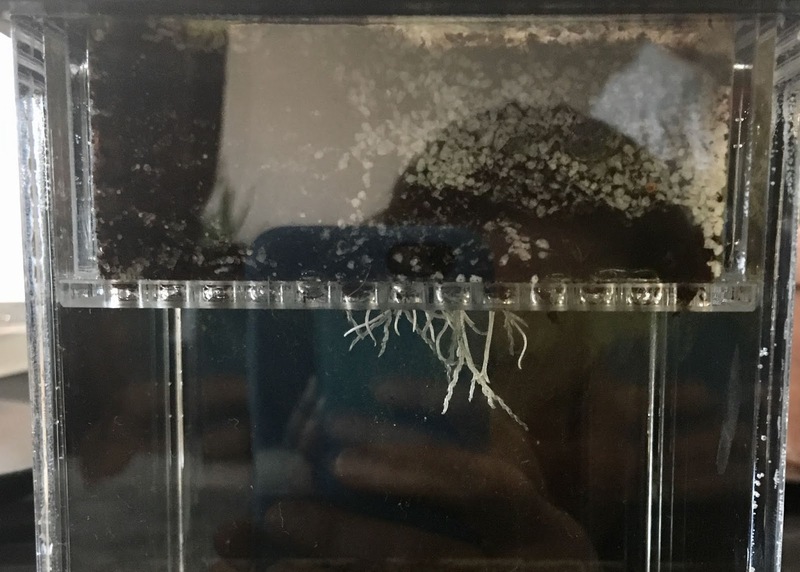 Would these biological controls work? In the mid 1990's the U.S. 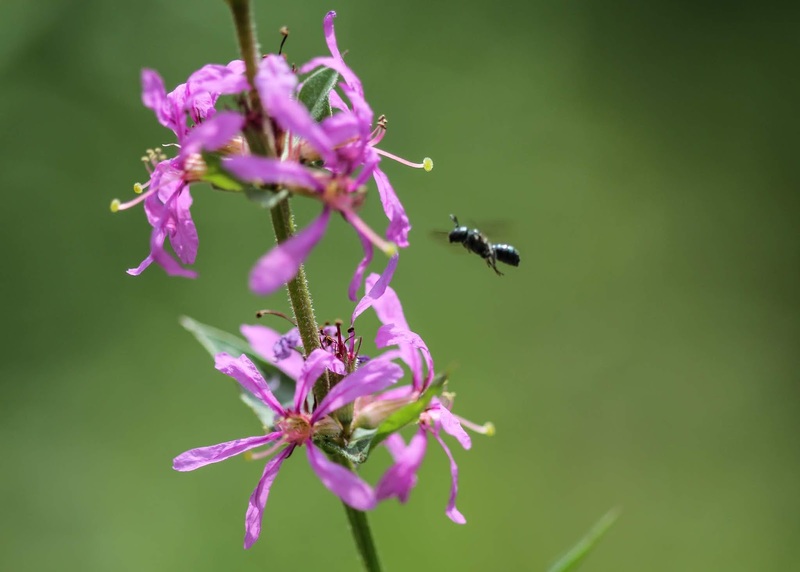 Fish and Wildlife Service began releasing the leaf-eating beetles in various suitable areas, including two National Wildlife Refuges here in Massachusetts. Between 2000 and 2008 the state government teamed up with various wetland conservations programs to release more beetles in Massachusetts through the Purple Loosestrife Biocontrol Project. 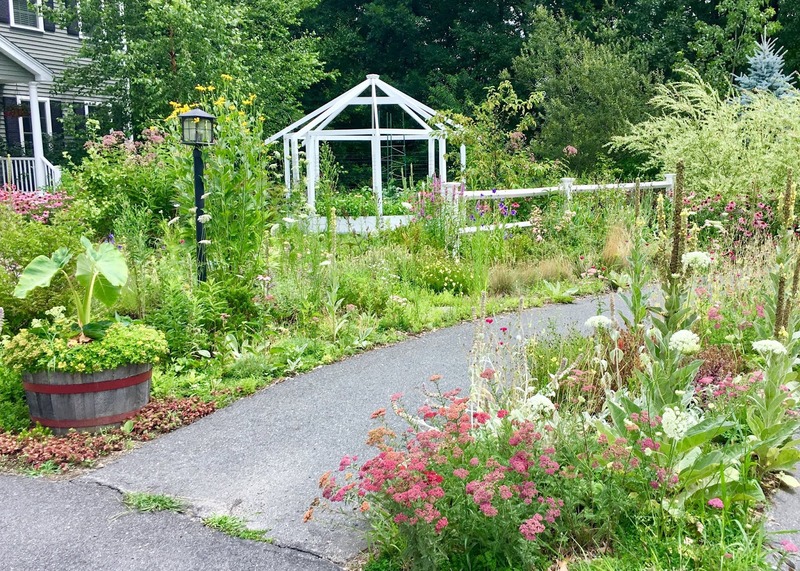 Beetles were released at 43 sites throughout the state, starting with Turner's Pond in Walpole, just a few towns away from me. 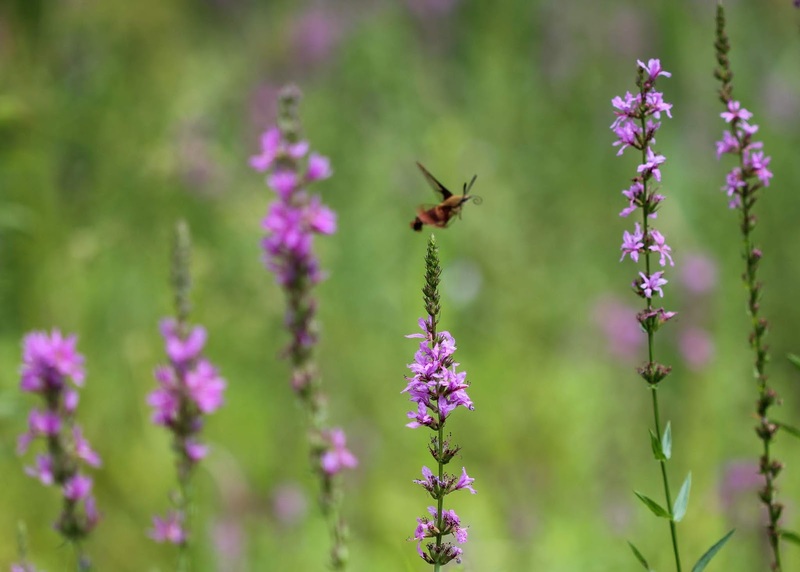 Within four years, Turner's Pond saw an 80% drop in Loosestrife plants. This biological control worked! 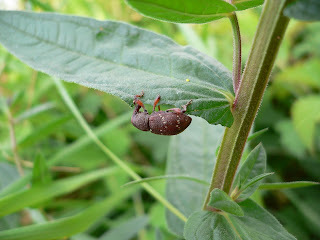 However, to be a true success, the release of the beetles should not cause any negative effects on the environment. 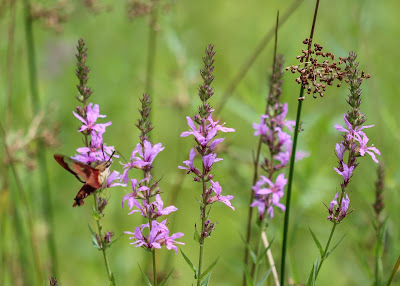 Studies have found that the beetles do sometimes feed on two similar native plants; however they prefer Purple Loosestrife, and no serious problems have been reported. Monitoring will continue, but so far this is one biological control that is a success! With all this Purple Loosestrife, I have quite a good meal for them! 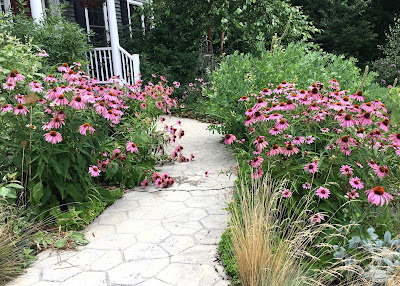 I feel like I've hardly been in the garden the past few weeks between traveling, visitors, and the weather. 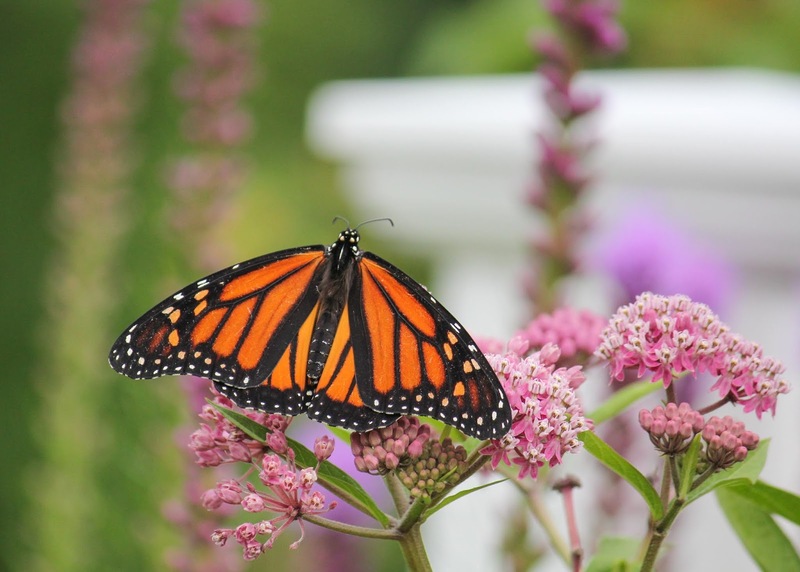 June ended on a heat wave, with temperatures soaring up to 97°F (36°C) into early July. While that might be normal temperatures down South, my body has now acclimated to the Northern winters and cooler temps. Thankfully the highs have since dropped back down into the 80's, which is more normal for summer here. Hopefully now that it is cooled down and I am done with my travels, I can finally give my neglected garden some attention. It is turning into a overgrown jungle. My parents recently visited, and my dad joked that he should have brought a machete to help me get through my garden. I have my work cut out for me! 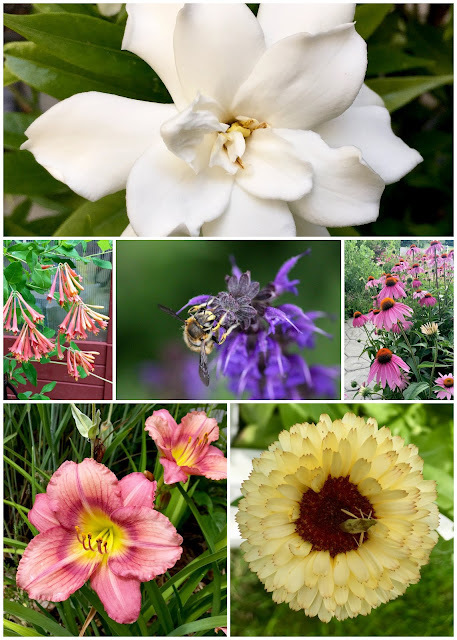 At least as I start the weeding and pruning, there are so many pretty blooms in the garden to enjoy. The garden is also full of birds, butterflies, bees, and an unfortunate number of baby bunnies. 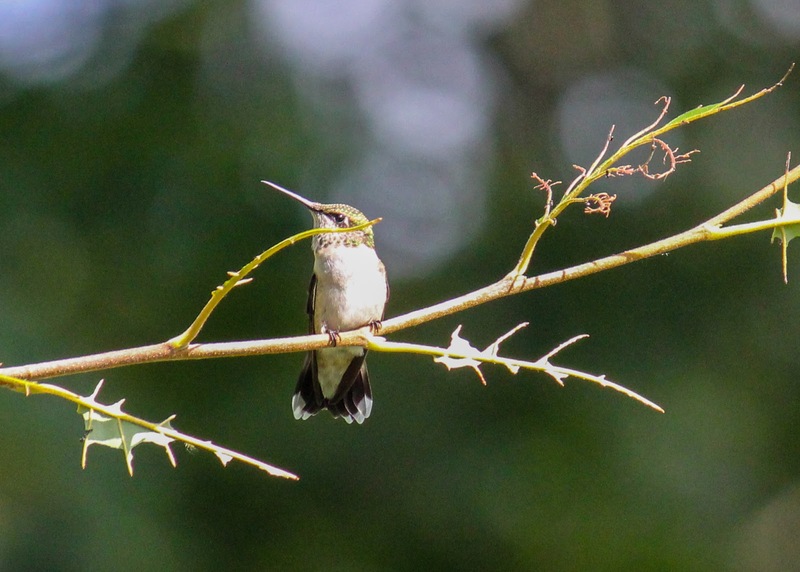 a perching Hummingbird - arguably cuter than the bunnies? I've started seeing Monarch butterflies almost every day here - a positive sign. Well, wish me luck! It's back to the weeding and pruning... and staking.